Robert F. Smith walked almost 1,500,000 steps in 32 days from Long Beach, California (Pine Avenue Pier) to Las Vegas, Nevada. Robert’s dream initially was to complete raising funds for a service dog that was needed for a boy who has severe autism and diabetes. Robert didn’t realize how much larger the vision would grow. Robert was able to touch the lives of Veterans, children with life-threatening challenges and, as usual, Robert always reaches out to those who have disabilities. Along his travels, he distributed multiple sports game towels. He was able to share his games with Veterans, Boys & Girls Clubs, churches and others. Last but not least, Robert shared over 500 Doopalpoops puppets to share with children who needed a smile. Robert has a nonproﬁt called “The Little Green Apples Project”, and it is thru this non-proﬁt that The Kindness Walk was born. Robert will begin the 2nd Annual Kindness Walk in September of 2019. He will walk from The Grand Ole Opry to Dollywood. The purpose this year will be to reach out to First Responders and support programs that are already in place to support their efforts and needs. ROBERT WILL BE WALKING ALMOST 1 MILLION STEPS! We want you to be part of our walk and you can sponsor as many steps as you wish. Each step is only a 25-cent donation. This 26 day walk will include 1,000,000 steps to reach his destiny. Each step taken represents an intentional act of kindness. You can sponsor The Kindness Walk with as little as 25 cents per step. 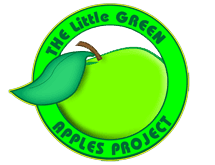 Decide how many steps you want to sponsor and make a donation in the Little Green Apples Project Store.